Cuetec cues feature a unique composite shell of fiberglass which completely encases the solid wood core in an armor of high-tech synthetic material. The fiberglass covered shaft has a super slim taper (SST) with Cuetec tru-glide finish, making it extremely smooth and durable. 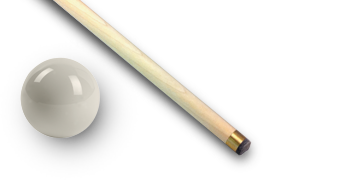 This cue is decorated with grey and black floating point decals. With a black super grip and a solid implex joint which provides full contact and a solid hit. The joint is bracketed by 2 nickel silver trim rings. An extension can be screwed into the bottom of the cue. Cuetec cues are permanently encased in power bond super strong fiberglass which makes them extremely ding, dent, scratch and warp resistant.